It is very easy to get lost while shopping for a new Sport Utility Vehicle. Between full-sized SUVs, mid-sized SUVs and the crossover genre, there are dozens and dozens of models out there. What makes one line more appealing than another? Does one automaker have a higher quality standard than another? What about price? Are there eco-friendly SUVs to choose from? Fortunately, the line of Toyota SUVs has plenty of options for all buying concerns, and all from an automaker respected and championed around the world. From economy sized to luxury, sport class to family class, traditional to hybrid, Toyota SUVs run the gamut of options. Not only are all these models available to buyers around the globe, but each comes with multiple trim levels and packages, so you can customize any of the Toyota SUVs to perfectly suit your needs and lifestyle. Take a brief look below at the history, prices and just a few little extras that show why Toyota SUVs are at the forefront of the sport utility vehicle race. The Toyota RAV4 is a compact SUV with a 4-cylinder engine. It comes with a long list of standard safety features, including traction control, lane departure warning and lane keeping assist, as well as “GOOD” safety ratings from the IIHS. It can comfortably seat five people but is also noted for its versatility in cargo room. When the seats are folded down, the Toyota RAV4’s cargo space nearly doubles, from 38.4 cubic feet to 73.4 cubic feet. This is among the very best cargo space dimensions in the compact SUV class. The RAV4 starts out at around $24,660 and has a total of 12 trim levels to choose from. Starting at $20,495, this is the most affordable of the line of Toyota SUVs. This subcompact SUV gets a modest 27/31 miles per gallon, but offers great handling and tons of safety features, such as brake assist and electronic stability control. It has a roomy front seat and more cargo space than the average subcompact crossover SUV in its class. This model is the baby of the Toyota SUVs, so it has some growing to do in order to keep up with its brothers and sisters in the Toyota family. It only has a couple of trim levels to choose from. Still, with its low price, it is sure to make many drivers happy. This is the old man on the Toyota SUVs block. Born out of WWII technology, the Toyota Land Cruiser began production in 1951. This luxury SUV clocks in at a whopping $84,565, but luxury buyers know exactly what they are paying for. It has a large, comfortable cabin with stylish accouterments and great standard features. Its engine power is reflective of its size, but it remains nimble enough in its handling to stand out in its class. While some of its competitors may be more luxurious, more comfortable or less expensive, few luxury SUVs combine all the elements that luxury SUV owners value like the Toyota Land Cruiser. Consistently getting praise the world over, the Toyota Highlander is ranked the #1 Midsize SUV by US News and World Reports. Like the rest of the Toyota SUVs, the Highlander comes equipped with a ton of standard safety features, such as forward collision warning and lane departure warning. Unlike most of the rest of the Toyota line, it has a four cylinder or six cylinder engine to choose from. The V-6 engine is a 3.5 liter capable of producing 295 horsepower and 263 lb-ft of torque and has an eight-speed automatic engine. The 27 miles per gallon it affords on the highway is in line with the rest of the SUVs in its class, but the handling and comfortable ride are far superior to most. It has 13 trims to choose from, making it one of the most adaptable SUVs on the market. In its current incarnation as a Midsize SUV, the Toyota 4Runner is best suited for the off-roading adventurous type. Its 4.0 liter V-6 engine can get 270 horsepower and tow up to 5,000 pounds. While the gas mileage is not ideal, the 4Runner is still a capable everyday vehicle. It started out in the early 1980s as a shell on a truck frame, and Toyota has kept that mentality ever since when building the 4Runner. It comes standard with protective skid plates, which add to its durability and stability when off-roading. Interestingly, the Toyota 4runner was named the third longest-lasting vehicle in the United States. It was the highest ranking SUV and the highest ranking Toyota vehicle, which had a total of four in the top ten. That’s not bad for a vehicle that excels when going off road. The Toyota Sequoia was the other of the Toyota SUVs on the aforementioned list of the longest-lasting vehicles in the United States. This offering belongs in the large SUV category but doesn’t drive like one. Seating up to eight and offering the same list of standard safety features that Toyota is known for, the Toyota Sequoia is ideal for a family vehicle. It has twelve trim levels to choose from so you can adapt it to suit a family of any size. It also features brake assist, lane departure warning and child safety locks, helping to ensure the safety of your family. Toyota also offers hybrid versions of its Rav4 and Highlander lines. The Rav4 Hybrid gets an incredible 34 city miles from its 4-cylinder engine and has the same great cargo rating as its non-hybrid counterpart. That is due to Toyota placing the batteries for their hybrid vehicles underneath the back seat, whereas most automakers will place it in the trunk. It also doesn’t lessen the comfort of the seating for up to five people. Much like its sister, the Highlander Hybrid is the highest ranked Midsize SUV Hybrid by US News and World Reports. Combining its electric motors with a 3.5 liter V-6, the Highlander Hybrid can generate 306 horsepower and still maintain 29 miles to the gallon in the city. With four trim levels to choose from, this is one of many Toyota SUVs worth multiple looks. Sport Utility Vehicle shopping can indeed be a daunting task. There are more than a dozen major automakers, each with several models, each of those models having multiple trim levels. Automakers around the world, especially Toyota, know that there are many different drivers with varying driving needs. Some are looking for dependability, some are looking for sport. Some want luxury in their SUVs, while others are looking for a reliable family vehicle. Regardless of your specific driving need, look no further than the expansive line of Toyota SUVs. Long known for its commitment to safety, Toyota is committed to including safety features as standard where other automakers might make those same exact features available only as optional features on higher trim levels. 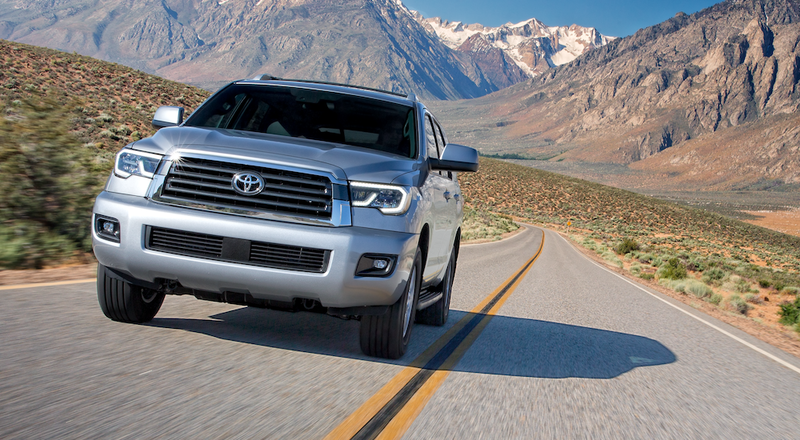 Head to your local new or used Toyota dealership and check these Toyota SUVs out in person. You can see the safety features in person, experience the expansive cargo and personal space, and feel the luxury for yourself. Whatever it is you are specifically looking for, you won’t be disappointed.